Smile is healthy. We all know that, don't we? My post today is going to make us smile because my mood today is relax and I want to take an easy time before I start to do upcoming serious tasks next month. Since I've changed my hair style in early July, I had an idea come up to write something fun. This hair style is the shortest I ever had in my whole life. I ever had short hair when I was child till teenager but it was not like I have it right now. So, what is that idea? 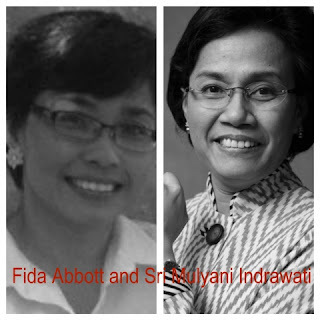 I'm sure you will smile when the first time reading the title of this post: Fida Abbott vs. Sri Mulyani Indrawati. But before we go further for that topic, I'm going to write what we are in the same things. 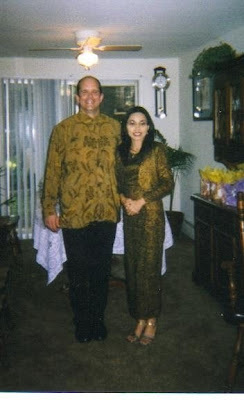 - They were born and raised in Indonesia; - They both were married and have children (Fida married to RN Gregory Abbott and Sri married to economist Tony Sumartono); - They have the same mission to strengthen Indonesia (Fida in writing and Sri in economy); - They have their names mentioned in Wikipedia pages (Fida at this link and Sri at this link); - They have their profile names published at the same magazine and at the same edition at Kabari Magazine but in the different topic; - They have short hair style and wear glasses; - They now live and work abroad. And what differences do they have? 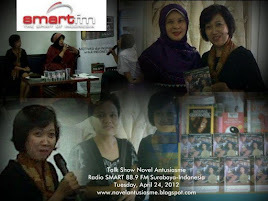 Fida obtained her Agriculture Bachelor degree from Universitas Pembangunan Nasional "Veteran" Jawa Timur in 1993. She served as a Marketing Manager at Jeji design and as a Marketing Supervisor at Stella Flora, Landscape Contractor and Consultant company. During her services at those two companies, she had handled many kinds of projects from small to big, from single houses and decoration for exhibitions to offices, real estates, apartments, hotels, plazas, and condominiums. Because of the economy crisis in 1997, she left her job and started to continue giving private courses to elementary school-senior high school students, and finally she landed her last career as a Senior Financial Consultant at AIG-LIPPO before she moved to US. Recently Fida has graduated from Strartford Career Institute and earns her Diploma with Highest Honors. Fida was selected as Managing Editor (volunteer) at KabarIndonesia, the first online Indonesian news based on the citizen reporter. KabarIndonesia now has over 13.000 reporters from around the world and as a pioneer citizen journalism media that was supported by 100% volunteers who have the same mission to improve Indonesians in writing skill. Through this mission KabarIndonesia has owned Online Writing Course named PMOH which gives a chance for Indonesians around the world who would like to improve their writing skill to take this course. To run this online course very well, Fida as a Director in this course works together closely with all talented and dedicated mentors to serve the students the best they can. Fida still loves being Managing Editor at KabarIndonesia since 2007, the place where she can contribute her little time and thoughts in editorial team. Fida also enjoyed her life being full time housewife in her first four years of living in the USA. * Sri is as professional economist. 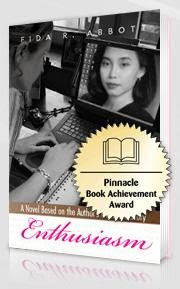 Fida is an author and a professional housewife (hahaha! I'm so proud to be this ones, a professional housewife. Who ever gives a housewife as a professional status? ); She hopes having good luck journey in the future to be a professional Administrative Assistant/Secretary. * Sri probably earns over $10,000.00 net of her income monthly. 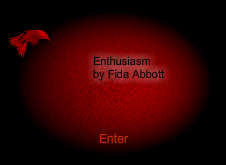 Fida would soon look for a new full time job that will give her earn more money at least additional $1000.00 monthly. * Sri probably lives in a luxurious apartment/house with several personal servants. Fida lives in a cute-nice-small house with backyard that gives her enough place to garden with her husband and her youngest daughter without any servant. 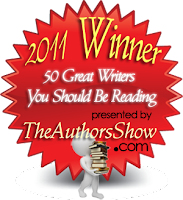 So glad to know you enjoyed reading my post and of course it made you smile. Have a great weekend, and also I hope you enjoyed celebrating your B-day with your friends and family. 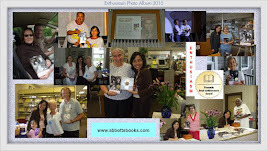 Happy Birthday and Happy Blogging.